We’re all aware that one of the major changes precipitating the European Enlightenment was the realization that the Earth was not the center of the universe. Through a series of discoveries, often fiercely opposed by protectors of the status quo, western cultures slowly embraced the idea that the universe is much bigger than we had previously believed. But perhaps we ought to consider how recent many of these discoveries were, and how new information is coming to light almost daily that promises to remake our worldview all over again. To review some of the milestones on this journey of discovery, Renaissance astronomer Nicolaus Copernicus published his heliocentric theory, De revolutionibus orbium coelestium, in 1543. Copernicus replaced the Earth with the Sun as center of the solar system, but the universe was still a smallish place, extending only to Saturn, which had been known since prehistoric times. The next planet, Uranus, was discovered by William Herschel in 1781, while his countrymen were fighting to retain their thirteen rebel colonies. Neptune was discovered in 1846, based on mathematical predictions made by Urbain Le Verrier to explain observed perturbations in the Uranian orbit (this was also a dramatic confirmation of Newton’s theories of gravity). But again, although our gaze had widened to include the solar system and the Milky Way, a background of more distant stars which had once been thought to all inhabit a single “sphere,” the universe was still pretty small and we were at its center. Although Immanuel Kant had speculated in the eighteenth century that the Milky Way might be an “island universe,” in April, 1920, Harlow Shapley and Heber Curtis debated the structure of the universe at the Smithsonian Museum of Natural History. Shapley insisted that the Milky Way was the whole universe, while Curtis argued that observations of the “Andromeda Nebula” suggested it was separate from and far away from the Milky Way, which he believed was only one “island universe” among many. 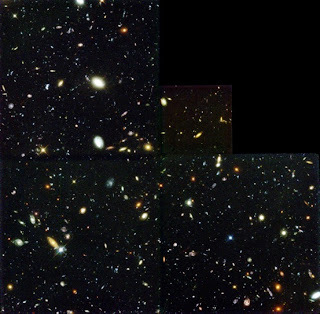 The existence of galaxies was finally settled by Edwin Hubble in the early 1920s, and in 1929 Hubble published his Redshift Distance law of Galaxies (now called simply Hubble’s Law), which for the first time suggested the true physical scale and immense age of the universe. In 1930, Clyde Tombaugh discovered Pluto, and in 2005 a team led by M. E. Brown discovered Eris, a Trans-Neptunian Object larger than Pluto that would certainly have been hailed as the tenth planet if Pluto had not already been demoted. 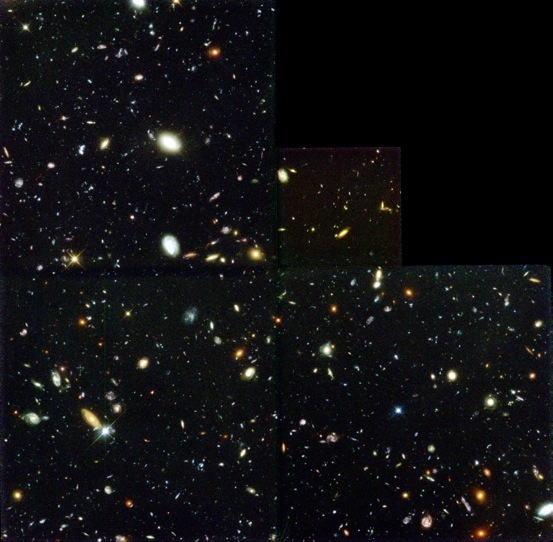 By 1936, when Hubble published his classification system for galaxies, we understood that the universe was much larger and much older than we had ever imagined. But we were still unique and special, many believed, because we were the only known solar system and the only place in the universe that harbored life. everyone? Outside science-fiction circles, however, Fermi’s question has been largely ignored. It was still possible, until the last year or so, to believe that even in a nearly unimaginably big and old universe, Earth was the oasis of life. Very recent discoveries make this belief much less tenable. Over the last few years, astronomers have begun searching for and finding planets circling distant stars. At first, most of these “exo-planets” were gas giants many times larger than Jupiter. But as the technology (primarily space-based telescopes and earth-bound computer processing power) improved, they began to find rocky planets not much larger than Earth. To date, astronomers have mapped the locations of hundreds of exo-planets, with thousands of possibilities waiting to be examined. Even the Alpha Centauri system, our nearest stellar neighbor, is now known to have a planet only 113% the size of Earth. The planet circling Alpha Centauri B is not Earth 2.0, however. It is too close to its star, so the surface temperature is much too high. In addition to believing the Milky Way was the entire universe, Harlow Shapley postulated “habitable zones” surrounding different types of stars, where liquid water could exist on a planet’s surface. Astronomers have generally regarded earth-like planets as the ideal places for life to develop, although some dissenters have pointed out that pressure as well as temperature influences the behavior of water, and there is ice on Mercury. So Shapley may have been wrong about this too, and the parameters for liquid water may be wider than just “Earth-like” worlds. But even if we restrict our search for possible havens of life to rocky planets in their stars’ habitable zones, these have now been located. And we’ve only scratched the surface. On average, astronomers have now concluded, there are 1.6 planets for every star in our galaxy. This is news – give it a moment to sink in. Even the astronomers were surprised. There are about 100 billion stars in the Milky Way. And there may be as many “rogue planets” drifting around on their own, not associated with any particular star. There are hundreds of billions of galaxies in the observable universe. But don’t take my word for it; I’m a historian not an astronomer. Check out the links to Space Fan News, produced by the Space Telescope Science Institute’s astronomer Tony Darnell. Tony does an incredible job distilling all the latest astronomy and astrophysics headlines into weekly videos on his You Tube channel. In one of my favorites, he sums up the discoveries of the last few months: “that comes out to tens of billions of Earth-size planets that could have liquid water, in our galaxy." Most of these revolutions in our understanding of our place in the universe have taken some time to filter out of scientific circles. But they have also been contentious, especially when scientific discoveries challenged widely held beliefs and dogmas. But aside from the history of science and religion, I wonder whether this underlying issue of where we see ourselves in the universe has influenced how we do history. I suppose (since it’s not my period) the change from a Ptolomeian to a Copernican worldview altered the way historians approached their work. Maybe that’s all implicated in modernism, but I wonder about the relationship between an expanding view of the universe and how we think of history. And I wonder what effect the discovery of life (intelligent or not) off Earth would have. Great stuff. Thanks Dan. I'm listening to Bill Bryson's terrific History of Nearly Everything for the 2nd time so that I can answer my kids' questions about the universe. Among other things he notes how important the earth's geological composition is to the maintenance of a habitable atmosphere. There are a lot of planets in the universe, but it's remarkable how many things have to go right for complex life to form, for bloggers to blog, etc. I agree with Chris--fascinating post, Dan. As long as mankind was in the center of things, expansion meant more power & dominion. Once we figured out we were just a pale blue dot, expansion meant a lessening of our importance. As you point out, in our own lifetimes it's been a constant lesson in lessening! A good reminder is Carl Sagan's "Pale Blue Dot," animated here: http://vimeo.com/51960515. Great post! Time to re-watch the Sagan stuff on YouTube. Here's a selection from Cynthia Stokes Brown's 2010 essay in Historically Speaking, "Why Aren't More People Teaching Big History?" "It has been almost twenty years since David Christian began saying to his colleagues in the history department at Macquarie University in Sydney that they needed to provide an introductory history course that started at the beginning of time—at the Big Bang itself. After some resistance, his colleagues eventually encouraged Christian to construct and teach such a course, which he did by inviting specialists in astronomy, physics, geology, and biology to cover the material that he could not yet handle. Now, almost twenty years later, how many courses that start with the Big Bang and go to the present are being taught in the world? David Christian has indefatigably written and spoken about the need for big history courses and the rewards of teaching them, but as far as I know there are still no more than about a dozen such courses at the college level. Fred Spier holds the world's only appointment in big history at the University of Amsterdam. Marnie Hughes-Warrington teaches big history courses at Macquarie University; David Christian teaches them at San Diego State University. Their former student Craig Benjamin teaches big history at Grand Valley State University in Michigan, while John Mears has pioneered it at Southern Methodist University. Other big history instructors include Walter Alvarez (geology) at the University of California, Berkeley; Eric Chaisson (astronomy) at Tufts University; Loyal Rue (philosophy and religion) at Luther College; Jonathan Markly at California State University, Fullerton; and myself at Dominican University of California. Many of those teaching big history share my experience of teaching it under the radar. We have often not asked permission, but simply used the names of world history courses on the books and transformed them into big history courses, informing the students of our intentions as we give out the syllabus. This strategy has enabled us to gain experience and to demonstrate the rewards of such courses, particularly the overwhelmingly positive response from students." I used to do some stuff with the idea of changing views of the world on intellectual understanding of history and religion in my first half of the American history survey. I would start with the Hereford Mappa Mundi with its carefully circumscribed world with Jesus over all, then do the Waldseemuller map with the first view of North America (outside that world), then do the Apollo 17 big blue marble, and end up with the very most recent images from the Hubble of distant universes. It was one of my favorite lectures, and always seemed to leave the students kind of gobsmacked that this could be history. Big history, though? Have tried to teach that, and you know how it went! Anyway, this is a lovely, lovely post. Thanks. Thanks, everybody! Big history is very challenging, not least I suppose, because unless it's given a course all its own, it's stealing time from the actual body of any other course. And if it's on its own, why not just call it astrophysics or paleontology? I was thinking of something that might be more of an intersection of environmental and intellectual history, I guess. As HCR said, more about questioning how the world view informed the ideas and actions within the period under study.